I have mentioned this before, but I love being able to get a lot of wear out what I buy, and being able to mix and match different things in my closet. 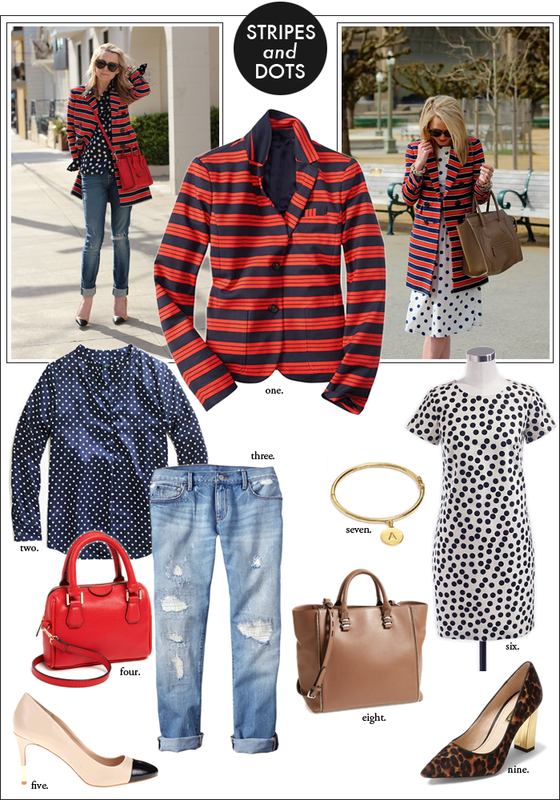 When I was looking back through some Atlantic-Pacific blog posts, I spotted a few looks styled around a striped blazer that reminded me a lot of one I had seen at Gap. This blazer would definitely be a great transition piece for spring, and something you could get a lot of wear out of -- dress up a pair of distressed boyfriend jeans or pair it with a fun sprint polka dotted dress - plus it is on sale! Great inspiration board! Stripes and dots is seriously one of my favorite combos! I love this jacket and that polka dot dress!